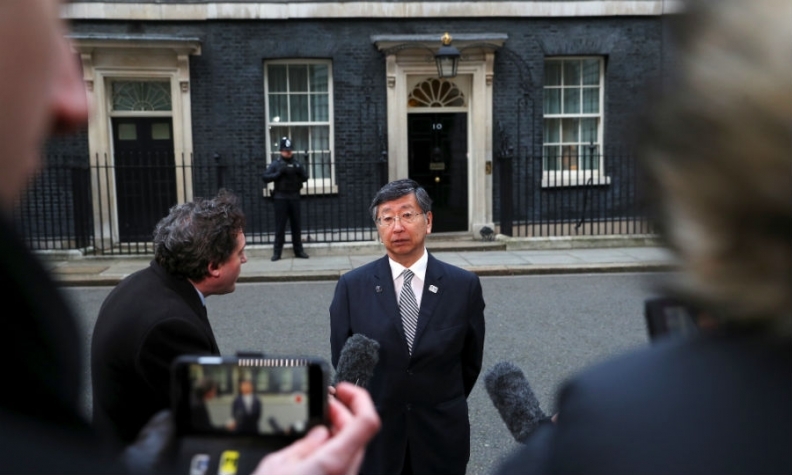 Tsuruoaka speaks about Brexit threat outside 10 Downing Street. LONDON -- Japan warned UK Prime Minister Theresa May that its companies would have to leave Britain if trade barriers after Brexit made them unprofitable. Nissan Europe Chairman Paul Willcox, Honda Europe boss Ian Howells and Toyota Europe CEO Johan van Zyl were among executives from 19 Japanese businesses who met May and several of her top ministers on Thursday to voice concerns over Brexit. Collectively the three automakers build nearly half of Britain's 1.67 million cars. Japanese firms have spent more than 40 billion pounds ($56 billion) in Britain, encouraged by successive governments since Margaret Thatcher promising them a business-friendly base from which to trade across the continent. Japan's ambassador to Britain issued an unusually blunt warning on the risks of trade barriers. "If there is no profitability of continuing operations in the UK - not Japanese only - then no private company can continue operations," Koji Tsuruoka told reporters when asked how real the threat was to Japanese companies of Britain not securing frictionless EU trade. "So it is as simple as that," he said. "This is all high stakes that all of us, I think, need to keep in mind." Japan, the world's third largest economy, has expressed unusually strong public concerns about the impact of Brexit on the UK, the second-most important destination for Japanese investment after the United States. In a warning after the shock 2016 Brexit vote, Japan expressed fears about a cliff edge that could disrupt trade when Britain formally leaves the bloc in March 2019. Major corporations have sought a two-year transition period, which they hope will ease Britain into its new relationship with the bloc. Both London and Brussels hope to agree a transition deal lasting until the end of 2020, in which Britain would remain in the single market and be bound by all EU laws, by a March 22-23 summit. May and her ministers assured Japanese businesses of the importance of maintaining free and frictionless trade after Brexit during the meeting but said nothing firm on the matter, a source familiar with the discussions told Reuters. "The point about frictionless trade and tariff-free trade was made in the meeting and acknowledged by the government and all sides as being important but nothing firm," said the source, who spoke on condition of anonymity. A spokesman at May's office said she had agreed on the need to move on quickly in the Brexit talks to secure a trading relationship with the EU that is as tariff-free and frictionless as possible after the transition period. Thursday's meeting came after a Brexit sub-committee of ministers discussed their Brexit strategy including how closely Britain should remain aligned with the EU and its customs union, a divisive issue for the ruling Conservatives. Brexit minister David Davis said there was still progress to be made in the committee, after disagreements between ministers erupted into the public domain.